Three years ago, I reviewed an exhibition of John Wardle Architects and NADAAA‘s new Melbourne School of Design. Even at that early stage in its development, I was captivated by their proposal. 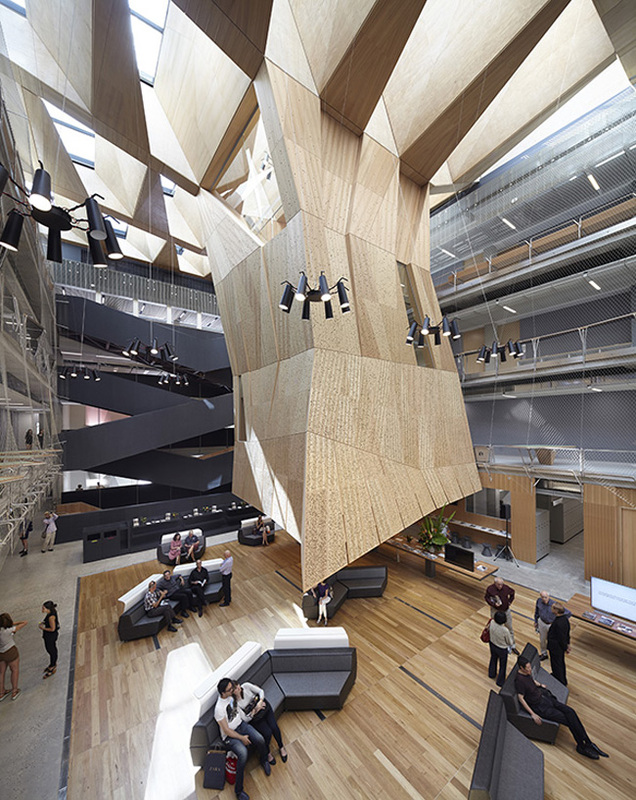 It felt like it would respond well to Melbourne University’s urban campus, would engage meaningfully in its architects’ aspirations for a built pedagogy, and was sure to be finished with all of JWA’s usual flair for detail. Then last year, I watched with keen interest as the building rose rapidly out of the ground, and in November was able to experience it finished and firsthand during presentations for my 2014 Design Thesis studio. Construction was in fact only due for completion by the start of this year, but thanks to the efficiency of its builder, Brookfield Multiplex, it wound up a miraculous five months ahead of schedule. Unfortunately, the faculty wasn’t quite ready to return to its new home, so the building spent most of that time sitting idle, patiently waiting for students to fill its walls. The faculty is at last ready however, and the new Melbourne School of Design is now fully operational. A couple of weeks ago I had the distinct pleasure of touring the building with John Wardle himself, at his softly-spoken yet enigmatic best, as part of an Australian Architecture Association Short Black tour. Prior to the tour, Wardle gave an incredibly insightful glimpse into the design thinking that shaped the MSD. No doubt well polished by many outings, his slideshow flew along at a cracking pace, bursting at the seams with the richness of the design. I was particularly interested in Wardle’s characterisation of his studio’s relationship with its American counterparts, NADAAA. Unlike many global / local ventures, where the local studio plays lapdog to the other’s design genius, this was a truly equal partnership. Throughout the design process, input from the two studios was 50:50, with conscientious effort going into preserving this balance. Even during documentation and construction, NADAAA maintained an active role in the project, contributing to the documentation package and flying staff in to visit site. No doubt this arrangement played a substantial role in helping the partnership win the commission in the first place. As Wardle noted, at the very least it gave them a distinct strategic advantage during the limited timeframe of the project’s initial open design competition phase, allowing them to work around the clock. Also fascinating was the contractual relationship between university, architect and builder. For such a finely crafted building, I was surprised to discover that it was built under a novated contract. Typically used within the cut-throat world of speculative developments, novated contracts aim to deliver projects on budget but are infamous for expedient design results. But then Wardle added the punchline: the novation occurred only once the documentation was 100% complete. I didn’t get the chance to question him further, but I do wonder whether there was much to gain from such an arrangement. So what do I think of the building? As construction was nearing completion, I remember being struck by the seriousness of it. Even with hoarding still up, I could not help but be impressed by its ambition. It is a large, powerful and expensive institutional building, and weighing in at $125m is poles apart from its predecessor, which was built on a shoestring budget stretched to breaking point. I have encountered criticism of the MSD budget, and the political role the building plays within the university’s never-ending bid to attract foreign investment. But to lament the role new infrastructure plays in a university’s marketing campaigns is to disregard the realities of the increasing financial pressures placed on tertiary education in this country. RMIT has the Swanston Academic Building and Design Hub, Melbourne University now has the Melbourne School of Design. More concentrated criticism comes from staff whom appear to have been swapped from generous office space in the temporary faculty building on Swanston Street to more cramped quarters. One tenured professor also made the insightful observation that the new building is larger than its predecessor, yet its gross floor area is smaller. In other words, $125m for a bigger building with less in it. As a sessional tutor without a dedicated office space, I suppose I have less skin in the game on these issues. I can stand at arms length from the faculty and assess the building with less bias. And really, I think the MSD is a very good building. Despite its size, the complexity of its programme and its diverse structural, construction, environmental and finishing systems, the MSD is a holistic work of architecture. In both JWA and NADAAA’s transition from boutique houses to much larger institutional buildings, the studios have demonstrated their capacity to retain this quality in their work. The MSD is all the better for this focus, a whole entity greater than the sum of its parts. Its monumental exterior is finely attuned to the environmental demands of the cartesian grid. The southern facade is the bluntest, polished precast concrete panels punctuated by an abstract composition of windows. 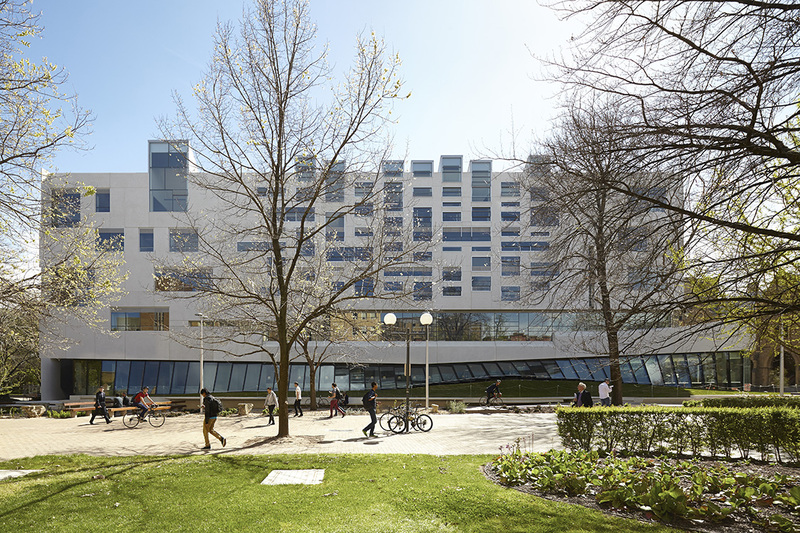 Wardle showed an early design section looking at this facade from inside the building, revealing how fenestration was designed from the inside out to vary the feel of identically sized teaching spaces ranged along its length. The northern, eastern and western facades are more filigreed, each draped in perforated zinc veils to block unwanted summer sun. Early iterations of these veils were motorised and automated, each piece puffing in and out in response to seasonal changes, but budget cuts meant true movement gave way to parametricism. This is an approach to design in which I confess to have little interest, but the result is a fine thing. 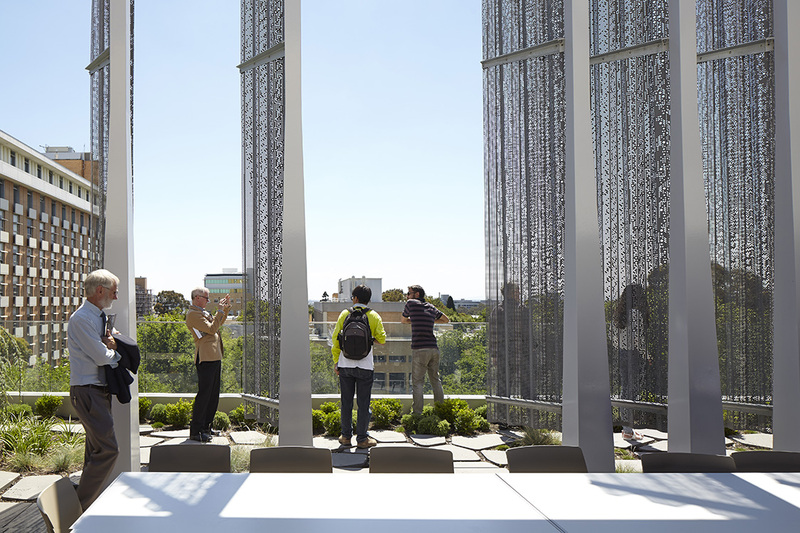 Intricately stamped and seamed zinc sheets protrude from an irregular steel frame, both their density and opacity controlled by the computer to achieve desired solar outcomes. It’s worth noting also that zinc was chosen as the material for the veils after research into embodied energy found it to perform better than both steel and aluminium. The base of the building is clad predominantly in glass, and is discrete from the upper reaches of each facade. It is transparent but not overwhelmingly porous. I suspect this is largely a university requirement for campus security, but I hope some of the more dynamic edge conditions will enrich the open spaces immediately surrounding them: an open amphitheatre to the northeast; galleries to the west; and a paved area to the north that is to be used by the adjacent timber workshop. This is a critical piece of the contextual puzzle and, until faculty programmes get fully up to speed, is for me still missing. The urban transition between the Swanston Street tram depot and Union House, the most heavily trafficked entry route into the campus, is smooth. The angular protrusions of the east elevation are a welcoming embrace to passers-through. 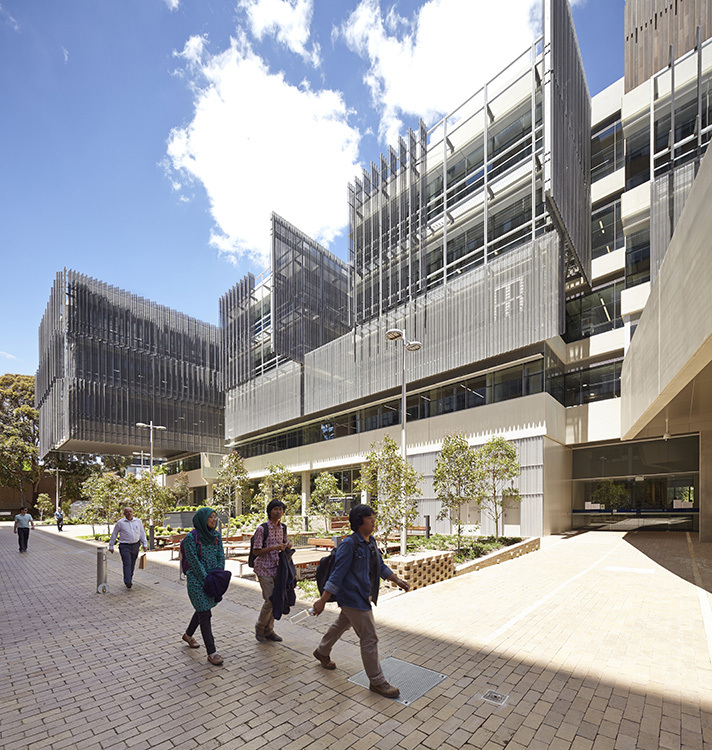 Wardle noted the importance of capturing this desire line, reflecting on the “largely unremarkable buildings at Melbourne University” that are contrasted by the “outstanding open spaces between them”. The internal street at ground level, designed to manage this flow of students, therefore establishes a new open space within the building. Its sloping concrete floor and joinery were conceived as a dry river bed, its edges activated by timber workshops and digital fabrication labs, the library and gallery spaces. Here is a more successful attempt at street-level public activation, and an opportunity to present to the many non-architecture students on campus the best that the faculty has to offer. Wardle even noted a secret agenda here, not to convert stray students into budding architects, but to instil in them an interest in its delights, and who knows, create future patrons of our art. While the outside of the building enjoys an austere material palette, the list of internal materials is long: concrete, steel, aluminium, timber, plywood, glass, mesh, plasterboard, pinboard, vinyl, foam, melamine. But even here the monumentality of the building is preserved, with very little applied pigment anywhere in the building. If the riotous colour of the aforementioned Swanston Academic Building represents the epitome of RMIT, then the honesty of materiality within the MSD does the same for Melbourne. The teaching spaces running along the south edge of the building open onto the atrium via cleverly rotating walls that engage in 21st Century thinking on tertiary learning. Gone are the old buildings’ acreage of drafting tables, which from my experience were alienating and rarely used. In their place are rooms that respond to what Wardle referred to as “nomads and settlers”, or the wide spectrum of spatial inhabitation particular to students. The teaching spaces therefore form eddies in the currents of circulation that wrap the atrium, encouraging engagement and, I would hope, the cross-polination of ideas. The upper level corridors are activated by a morphing series of individual desks, benches and study tables. In some instances, these are little more than flat surfaces on which to rest a laptop, and in others are communal tables for spreading out and settling in. Further informal spaces litter the building, each picked out with its own personality, and all of them well-patronised during our tour. At once conspicuous and invisible, the stainless steel mesh that gift-wraps the atrium provides fall safety while doing away with more opaque balustrades. Of all the communal rooms within the building, I am most fond of the grand scissor stair that connects the four floor levels from the atrium up. With its collegiate 1:3 gradient and criss crossing pattern, it is a natural social incubator. It is so gentle that it almost enforces a meandering pace and scholarly dialogue. It also addresses one of the major gripes I have with many institutional buildings, whose stairs are timidly tucked inside musty, unwelcoming fire shafts. The MSD has these as well, but the grand stair is so good to use I can’t see why anyone would bother with the lifts. All elements of the MSD, both inside and out, have been designed to maximise the opportunities for a built pedagogy. 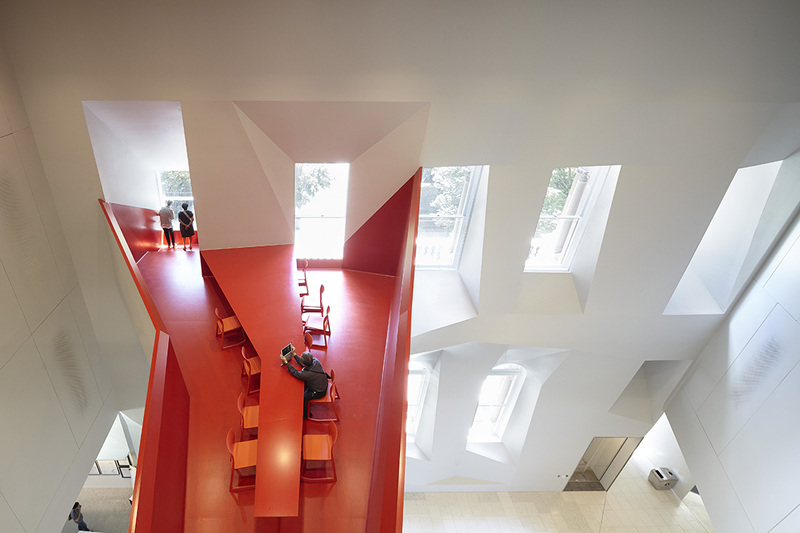 In other words, JWA and NADAAA designed the building to play a role in the education of its students. The layers of construction, from primary structure all the way through to finished linings, are pulled back and revealed, their relationships explained. The steel trusses that run along the base of the grand stair for example are left fully exposed, machine markings and all. Each corner of the building expresses a unique way to execute junctions between materials. 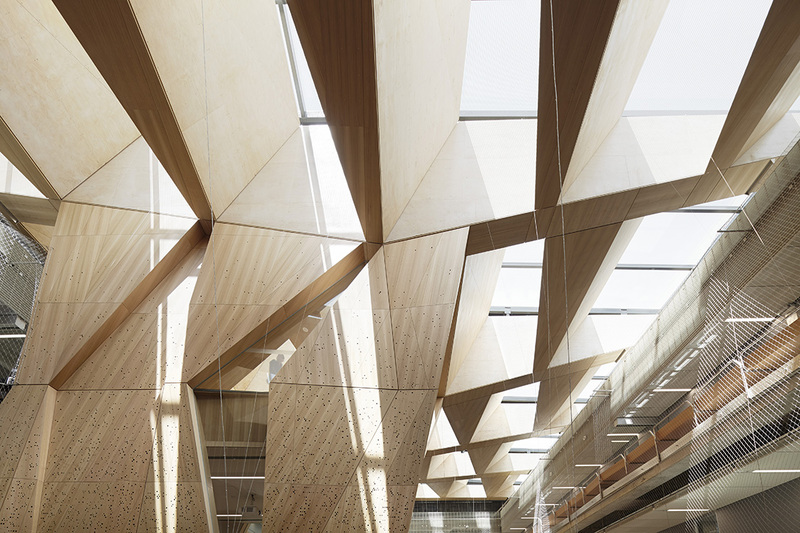 Timber panels in the coffered ceiling and hanging studio are, as Wardle puts it, in turns “raw and cooked”: structural members are left in their unfinished state while room linings are sealed and polished. Even the structural piles running around the perimeter of the building are visible thanks to carefully placed windows in the basement. History plays a role too, with the Bank of New South Wales facade now incorporated into the west edge of the building. What used to be several floors of administration offices behind the facade are now a void, a curious strategic move that both relinquishes valuable gross floor area and accentuates the heritage engagement of the new building. Nostalgia over pragmatism? Heroism over sustainability? Perhaps this too is an opportunity for teaching through experiencing. Such a sustained focus on built pedagogy will provide systemic benefits to the way curricula are devised and classes are taught. Construction tutorials will tour the building in search for structural members in tension and compression; environmental sustainability classes will study the solar paths that shape the zinc veils; and dreary lectures on services will now be enlivened by visiting actual services in use around the building. 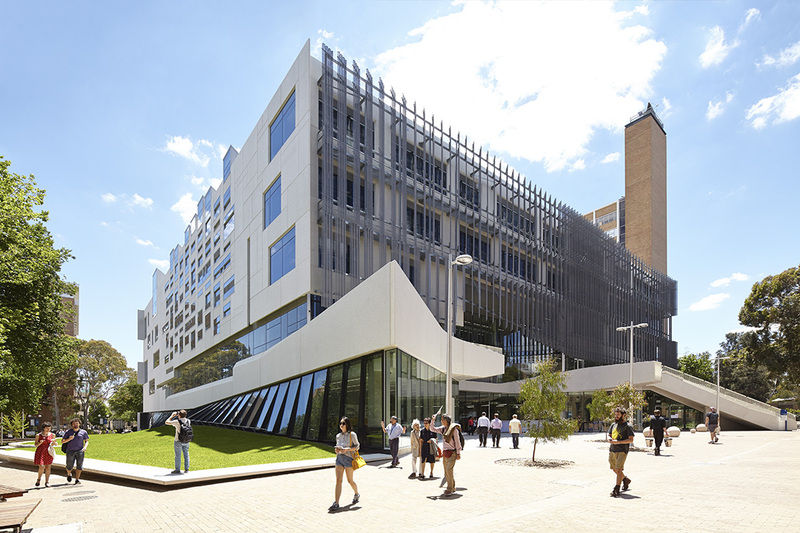 The Melbourne School of Design is a highly accomplished building. Its holistic, singular vision is its greatest strength and will certainly lead to a host of deserved accolades. It does what most buildings do not, closing the gap between the process and outcome of making, telling the story of its genesis through the layering of its skin. Its spaces are for the most part generous and collegiate, (almost) making me wish I could go back and learn how to be an architect again. At the very least, I am pleased to be on the other side of the learning fence, and look forward to teaching within its walls next semester. Curiously, the MSD’s singular vision may also be its greatest weakness. As one colleague remarked to me after the tour, I wonder if Melbourne University will now start churning out battalions of mini John Wardles? Even if they want to, can the students resist the design influence this building will have on them? In a roundabout way, this question leads straight back to RMIT, whose simultaneous investment in the minimalism of Godsell and exuberance of Lyons offers a more inclusive conversation about design. Clearly, Melbourne University has built (and is building) a host of other substantial works around campus, but as far as the architecture faculty goes, the MSD is more or less it. For now, I can only say that I very much like this building. 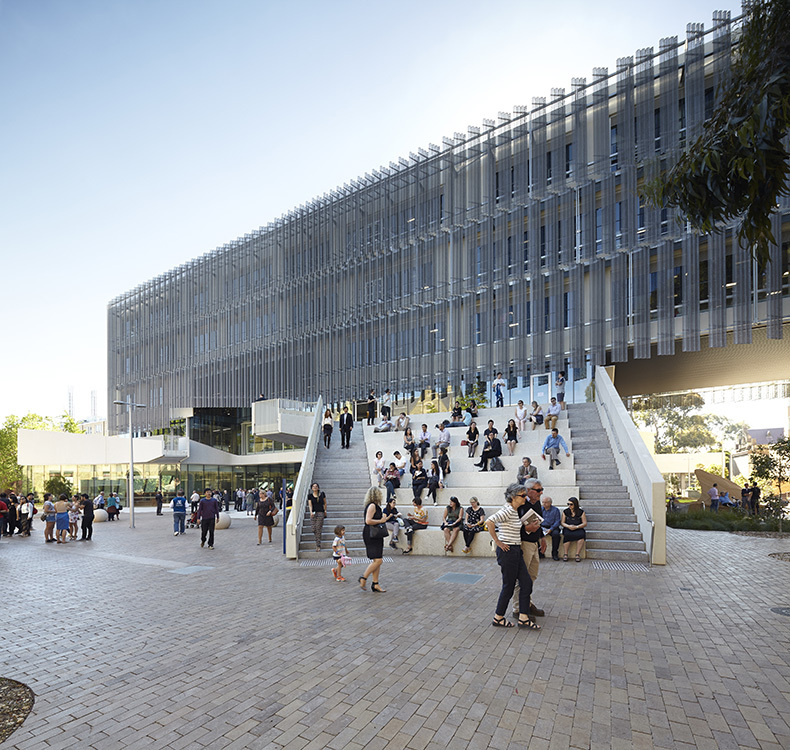 It is a worthy addition to Melbourne University’s beautiful campus, and I’m sure will become a valued environment for learning. It’s clear the students already feel this way: even at 8pm at night, the atrium space was abuzz with them. As we disbanded after the AAA tour, I discovered with some humour though that most weren’t studying architecture at all. They were medical students, who have apparently taken to the warmth of the building with zeal. Perhaps among them were Wardle’s future patrons, already alive with the spirit of fine architecture. My thanks go to Steve Rose, the AAA’s hard working Melbourne representative, for organising the event. Keen to prove their design partnership could be more than a one hit wonder, JWA and NADAAA have subsequently entered and won a competition for a new bridge within Melbourne’s sporting precinct. Melbourne School of Design, open arms. This and all subsequent images courtesy of Nils Koenning. 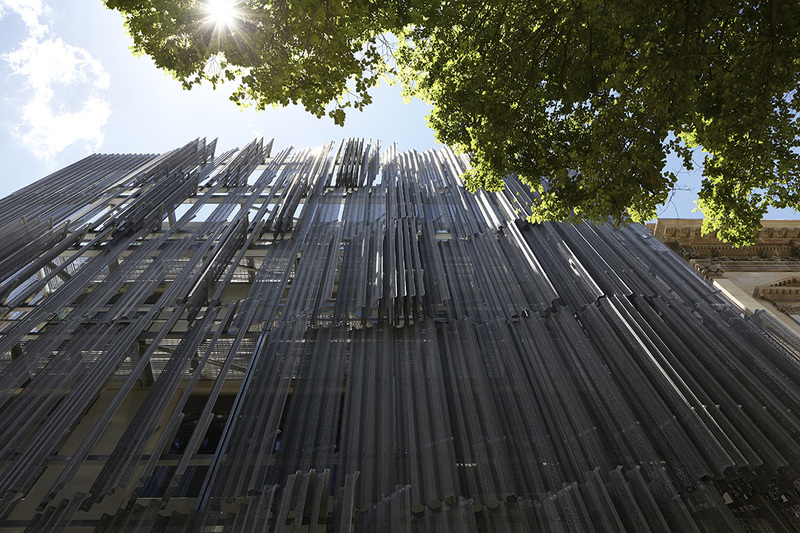 Melbourne School of Design, north facade. Melbourne School of Design, amphitheatre. Melbourne School of Design, cantilever. Melbourne School of Design, south facade. 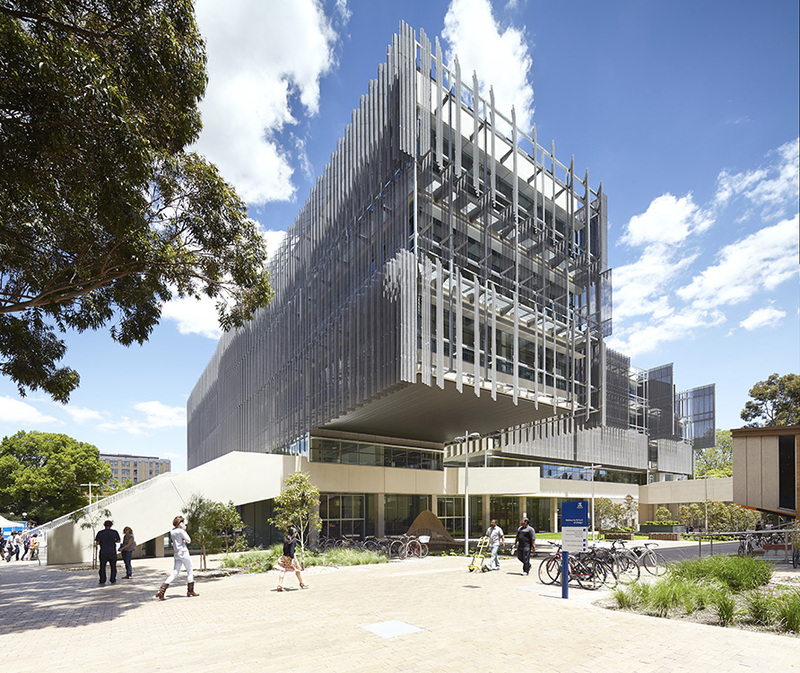 Melbourne School of Design, zinc veil. Melbourne School of Design, hanging studio. Melbourne School of Design, coffered ceiling. Melbourne School of Design, behind the heritage facade. Melbourne School of Design, roof deck. Thanks for writing an insightful and considered piece on our building. It is gaining considerable attention globally as a benchmark for academic buildings. The construction budget was $98m ($129m was the total project cost including demolition, temporary facilities, consultant and permit fees etc). The building accommodates teaching for 50% more students (we can handle 2500 students), provides casual workplaces for hundreds many more students concurrently (the old building had very few places for students to use) and has more staff workplaces than the previous buildings. I don’t know who your source is but they are clearly mistaken. I also have data from our quantity surveyors that confirms that the building cost less per useable square metre than the median of 23 academic buildings constructed across Australia from 2012-2015.